The battle for e-book reader dominance isn’t the kind of consumer product war that’s likely to raise a big audience. Despite Amazon’s high profile Kindle, the market for e-book devices is, for now, relatively small. Still, that’s not stopping companies from asserting claims or taking shots. Earlier this week Discovery Communications reached for its piece with a patent infringement suit levied at Amazon. Today, Sony and Google took a subtle jab of their own at Kindle. In a press release this morning, the companies announced they were partnering to make more than five hundred thousand public domain titles Google has digitally archived available to Sony reader owners at no charge. These books, which include works ranging from Mark Twain to Leo Tolstoy and Jane Austen, are all clear of copyright restrictions. Google’s digitized them as part of its book search program. Making them available for Sony’s reader will expand Sony’s library catalog of available content to near 600k titles. That will put the company well ahead of Amazon’s approximately 250k titles. The inference and talking point being set out is that Sony’s platform is open whereas Amazon’s is not. That’s not completely accurate. Both companies sell DRM-encrypted content and both companies’ products can also view third party media in some other formats. The difference is that on a Kindle, Amazon doesn’t make this especially convenient. With Sony’s reader, its emphasized as more of a feature and made simple. In a way, the difference underscores what is a major distinction in the business strategies of the two companies. Sony is a product company first and foremost (the movie and music businesses excepted). For the electronics Group, Sony measures success based on the sales of hardware. Content offered in Sony’s bookstore is there to help sell these devices and expand the user experience. Third party content is allowed because it serves the same goal. Amazon in contrast, is a retailer and it seems to be approaching sales from the opposite shore. With Kindle, the yardstick for success seems to be how the device drives digital media sales rather than sales of the device itself. Put another way: Amazon sells a device (the Kindle) as a way of driving digital media sales. Sony offers digital media as a way of driving the sales of its device. 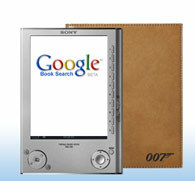 • No New Kindles in ’08 But Improved Display’s in 2009?